Girl Scout Sally is pictured here (far right) with other Girl Scouts from different parts of the country and African singer, Angelique Kidijo! Last summer, Girl Scout Sally from Girl Scouts of Central Maryland had the opportunity to attend the Girls’ World Forum (GWF) in Chicago where she and 500 Girl Scouts and Girl Guides from 90 countries and 82 Girl Scout councils had the chance to get in on the conversation about three of the UN Millennium Development Goals which were to Eradicate Extreme Poverty and Hunger, Promote Gender Equality and Empower Women and to Ensure Environmental Sustainability. Through this conference Sally had her first jolt of inspiration to change the world; “Without a doubt in my mind, my experience in Chicago is what gave me the “change-the-world” bug that I don’t think I’ll ever grow out of, said Sally. “GWF helped to give life to my philosophy that no matter how young you are, you can change people’s minds, you can improve people’s circumstances, and you can be a part of the ongoing task to make the world a better place to live,” she added. 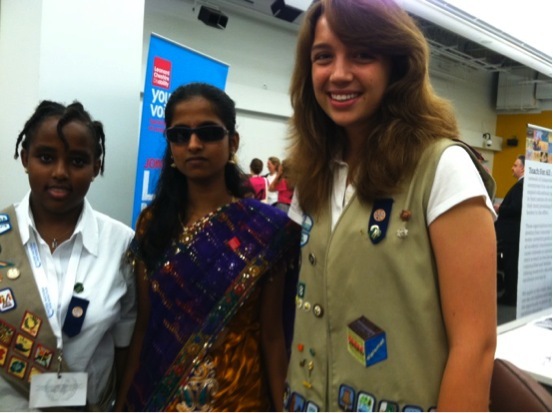 Girl Scouts Hannah (Left) and Sally (Right), with a Pakistani girl who spoke about the rights to education and accommodations for disabled youth. Now, almost a year later, with her GWF experience in-tow, Sally has been selected for a new opportunity. 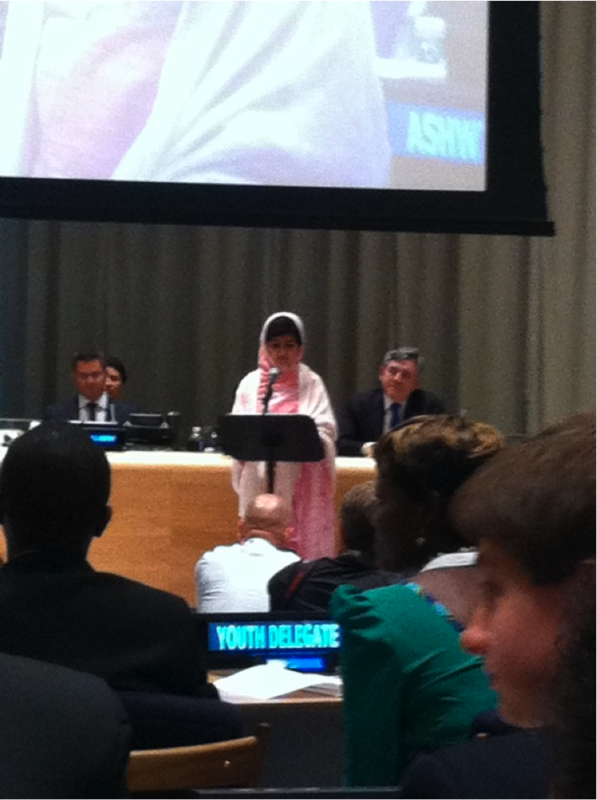 On July 12th, Sally attended the Malala Day Youth Takeover of the UN. “Being a part of the UN Youth Takeover was empowering and engaging. The Youth Takeover was actually my first conference that was not directly focused to Girl Scouts, which was a large step out of my comfort zone, to be honest. However, once I got to meet young men and women from all over the globe, and hearing their personal experiences and perspectives on global education and equity, I knew it was absolutely worth it,” said Sally. Malala Day was named for teenage women’s rights and education activist, Malala Yousafzai who was shot by the Taliban in Pakistan for trying to go to school. Malala led the first ever youth takeover on her 16th birthday, with powerful words of courage and wisdom. “Malala Yousafzai is powerful, and every word she spoke left an impression on us that will, in my opinion, stay with us forever,” said Sally. GSCM is extremely proud to call Sally our own and we look forward to the great things that she is bound to accomplish with her unyielding ambitions to change the world and compassion for those who need it most. Keep up all of your awesome work Sally, and NEVER give up on your dream to make the world a better place! Did your experience at the Girls World Forum in Chicago last year help in any way to prepare you for this event? GWF was my first international conference, and I can honestly say that having attended a similar event in the past put me in a WAY more comfortable mindset for participating in Malala Day. I was more open with my personal opinions, I shared my voice during Breakout Sessions, and I even got the opportunity to speak in front of a crowd, and was more excited than nervous! Aside from the comfort level, GWF helped to give life to my philosophy that no matter how young you are, you can change people’s minds, you can improve people’s circumstances, and you can be a part of the ongoing task to make the world a better place to live. That idea is what got me so excited for Malala Day, because it fortified that passion, and helped me to develop a further understanding of the UN’s Millennium Development goals! How did you come into this opportunity? Malala Day came to me rather off-guard, actually. Allison Jakubczyk, the Teen Leadership Specialist at GSCM has been not only a huge asset in my life-changing endeavors, but also has become a very close friend of mine over the past couple of years, and man, she is a GOOD friend to have! She forwarded me an email one day with a link to the information regarding the event, and she also mentioned that she had already recommended/nominated me to possibly be selected as one of the 5 American Girl Scout delegates at Malala Day. The more I read into it, the more interested and excited I was about the whole thing! I immediately started picking up on some similarities and connections between last year’s Girls’ World Forum and Malala Day! A couple days following that original email, Allison sent me another saying that I had been selected, and holy cow, I freaked out! What was the overall feeling in the room while Malala was speaking? The overall feeling in the room when Malala stepped up to the podium was overwhelming with all kinds of emotions, like admiration, sympathy, anticipation, excitement, grief, hope, every emotion in the book! Malala was just so convicting with every statement, and she made this unbelievable goal of hers sound almost simple. She said, “Let us pick up our books and our pens. They are our most powerful weapons. One child, one teacher, one book, and one pen can change the world. Education is the only solution. Education first…” and “Be peaceful and love everyone.” These statements, and many others similar to them, are what made us all feel that global education is attainable, and that we can make a difference without violence or guns or hatred, but with wisdom and peace. The feeling in the room just echoed with power and self-confidence! It was wonderful! What was your favorite part of the whole experience? Unfortunately, I can’t give you a single isolated moment that I can call my “favorite part” of Malala Day. It was all incredible, every second of it! I loved meeting the 7 other Girl Scouts throughout the experience, because we acted like sisters within hours of meeting each other! I loved hearing Malala’s speech, because it was a “once-in-a-lifetime” experience. It’s one thing to have watched her speak on television or via webcast, but sitting within feet of this visionary world leader, it was nothing short of an immense honor! I loved the Breakout Sessions (sessions where we separated into groups to discuss our opinions and ideas regarding global education) because when I voiced my ideas and viewpoints, people listened, and they cared, and they responded, and I felt like I was making my mark on this event! I also got to exchange thoughts and learn from the other youth in the group, which expanded my perspective to a global understanding, rather than just my own. I was absolutely blown away by that! I swear, that’s what he said, no joke! Thanks To Our Sponsors for Supporting SHARE!